Reece’s Rainbow is so outstanding in great part for it’s community atmosphere. Real people supporting real needs–not fancy posters and pamphlets that leave you feeling alone and vulnerable. The Reece’s Rainbow team are mothers who have adopted and have close acquaintance with program details and agencies that are reliable. Through the boards and blogs easy access to families who are in the process of bringing home children internationally are readily available should they choose to be, making a wonderful in action recourse for discovering current events in that countries adoption administration whichever it may be. Visit this link to begin the search for your child. There are about 1000 children listed for international adoption right now, through Reece’s Rainbow alone and when you find them let me know and join writing on 1000 Monkeys Jumping on the Bed as I’m adding Guest Speakers. 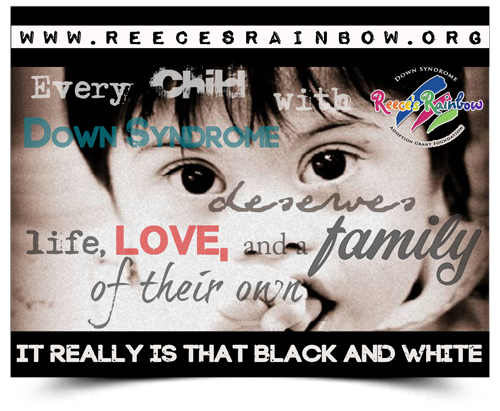 Reece’s Rainbow is not an adoption agency. They partner with timed agencies, known to do outstanding casework and in country management; families can trust that they will be well cared for along their journey to adding their son or daughter who was born overseas and has been waiting to be found. 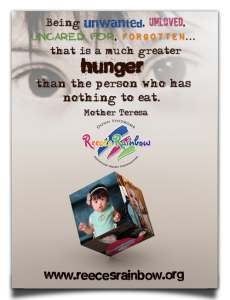 Follow this link to learn more about the countries that Reece’s Rainbow currently partners with. The list is growing, as are the number of children listed on a daily basis. People add second children to their adoptions, go back for more and others advocate and raise funds year after year for waiting children and adopting families. The second is where this blog comes in. Today is my 29th birthday, and Reece’s Rainbow’s 999th adoption commitment. Reece’s Rainbow is rocking their seventh year in bridging the difference between families and their overseas children.